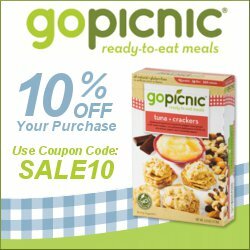 GoPicnic is a great website to go to when looking for ready-to-eat meals and snacks that are all natural! A lot of their products are gluten-free and you can find many vegan and vegetarian choices. This would be a great way to send healthier foods in your child's lunch this year. Win a GoPicnic Care Package valued at $29.99! Free to enter & easy to win!